After a year of mishaps and gaffes that left many analysts, journalists and moviegoers wondering how it could possible survive until Oscars season, MoviePass has rolled out a three-tiered subscription plan that’s also priced more expensively in markets like New York and L.A. than it is in the heartland. The company also elevated Khalid Itum to executive vice president from vice president of business development, and says he will run day-to-day operations under chairman and CEO Mitch Lowe, who will focus on long-term issues. And, in interviews this week with journalists at several influential publications, it acknowledged it has a massive PR challenge. “MoviePass has read your enraged tweets. It has fielded your angry calls. And, yes, it’s seen those memes that showed images of its offices engulfed in flames. Despite becoming a trending topic for all the wrong reasons, the company that once planned to be the Netflix of moviegoing believes it can win back the trust of its customers after a bumpy year that’s led to a wave of articles predicting its imminent demise,” writes Brent Lang for Variety. 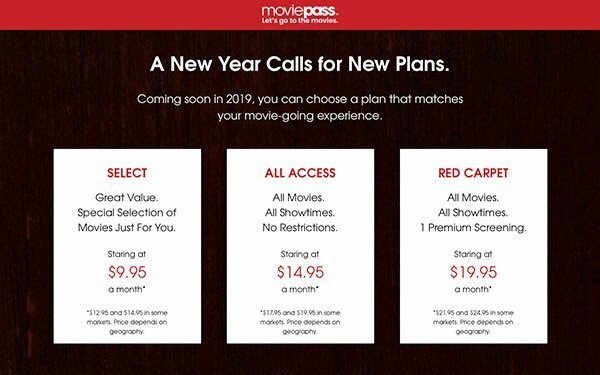 Its new “Select” plan ranges from $10 to $15 depending on the region and allows customers access to a limited selection of three movies per month on a limited number of days. “All Access” ranges from $15 to $20 for three movies, but subscribers can see any movie they want on a regular screen at any time. “Red Carpet,” which ranges from $20 to $25 per month, allows access to one IMAX, 3D or other large-format screening per month. “We need to be empathetic and think about our members -- what it’s been like for them to be whiplashed and wake up one day and this is different and now this is different,” Itum tells Barnes. The movie theater subscription service is a majority-owned subsidiary of the Big Data company, Helios and Matheson Analytics, which reported three weeks ago that it lost $137.2 million in the third quarter. MoviePass is now accepted at more than 91% of theaters across the United States, the company claims. But it’s not the only choice out there for folks who aren’t so riveted to the superior content on their iPads and big-screen TVs that they are willing to brave the increasingly unstable elements to watch the likes of “The Commuter” at the bijoux. “MoviePass now faces rivals like Sinemia, a similar service currently offering three tickets per month to 2-D movies, with no inventory restrictions, for $9 per month. For $20 per month, AMC Stubs A-List gives you three movies per week, including IMAX and 3-D showings. And infrequent moviegoers might find the $9 Cinemark Movie Club subscription more appealing; it's just one 2D movie per month, but comes with no other restrictions, includes 20% off of concessions, and lets you roll over unused tickets from one month to the next,” Brian Barrett points out for Wired. “MoviePass grew from a mere 20,000 subscribers in August 2017 to more than 3 million this past June,” writes Patrick Ryan for USA Today. But “by having it unlimited, we were attracting a small, but very costly percentage (of subscribers) that prevented us from providing a great and consistent service to the casual moviegoer,” CEO Lowe tells him. It remains to be seen if reality-based pricing proves to be a more compelling storyline. 1 comment about "MoviePass Launches New Pricing Scheme With PR Blitz". Ron Kurtz from American Affluence Research Center, December 6, 2018 at 9:49 a.m.
As a former customer, it sounds like they still don't understand their market or have a sustainable business model. I am an AMC subscriber now and find it works well.